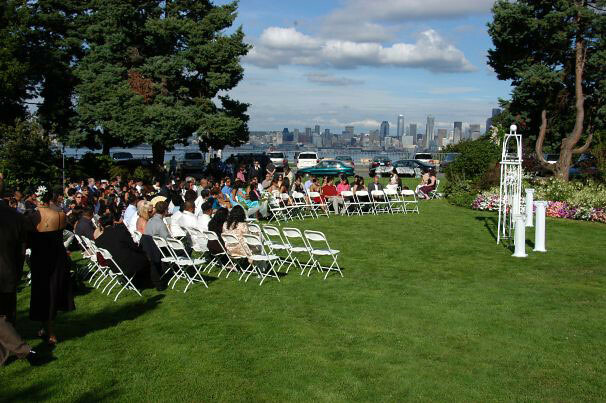 Seattle parks and gardens make lovely and inexpensive outdoor venues. Surround your ceremony with the elegance and beauty of nature. Read on for info about how to make your reservations. Choose from an array of quiet gardens, picturesque viewpoints, open meadows, and intimate natural settings. You can schedule an outdoor ceremony in almost any of our 400 parks. See some of our favorite outdoor ceremony sites on Flickr. Download our guide Scheduling a Ceremony in Seattle Parks for useful planning information about our frequently requested ceremony sites, fees, and general guidelines about use of the park. Once you have found the perfect location for your event, please call the event scheduling team for assistance with reserving your ceremony location. The following parks are available for reservation on the first day of each new month, one year in advance: Arboretum, Bhy Kracke, Hamilton, Viewpoint, Kubota, Martha Washington, Oxbow, Parsons, Roanoke Park, and Sunset Hill Viewpoint. For all other parks, scheduling begins the first business day of January of that year. We schedule one ceremony per day, per park, with the exception of Parsons and Kubota where you can choose from three time options. See our brochure for more information and available options. The following map shows the city-wide locations for suggested outdoor ceremony sites. Click on a star for more info, or explore the map in a new tab here. Permit - To hold a ceremony or special event in a public park you need a permit. Ceremony Permits guarantee that no other ceremony or event is scheduled at the same time in the same location. The park remains open to the public at all times during a ceremony. A permit does not guarantee exclusive use of a park area for a private event. We issue ceremony permits on a first-come, first served basis. Parking - No vehicle access is allowed into parks. We cannot guarantee that parking will be available for your ceremony, though parking lots and on-street parking are available at some sites. Services - We can schedule a site for you, but we cannot provide wedding planning services. We highly recommend that you visit your preferred locations prior to making your reservation. We may require that you hire a Parks attendant to monitor the park from start to finish. Alcohol - The Park Code (Seattle Municipal Code chapter 18.12.257) prohibits alcohol in Seattle parks. All outdoor ceremony sites are alcohol-free. Ceremonies which normally use wine must substitute with a non-alcoholic beverage. Equipment - You must finish all delivery, setup, and cleanup during the time included in your ceremony permit. We do not provide setup. You must arrange through a private vendor for equipment such as chairs, canopies, or catering gear. You may have one canopy as long as it does not exceed 20 feet by 20 feet in size, and must be open and contain no walls. Sound - Battery powered amplification systems are allowed only in specified areas (no electricity available). Amplification systems are limited to microphones, CDs and iPod/MP3 players. With a ceremony permit amplification is permitted for the ceremony portion only and not the entire event. Decorations - When staging your decorations, please keep the environment in mind. Do not put nails into trees, or stake anything into the ground. Apparatus such as canopies must be free weighted. We don't allow confetti, seeds, or rice; try flower petals! Remove all decorations at the end of your event. Photographs - Your ceremony permit allows you to have photographs taken at the park you have reserved. If you want to take photos at another park, we determine if other fees apply. Refunds - Reservation fees are not refundable. This includes inclement weather. Additional Questions? Please take a look Scheduling a Ceremony in Seattle Parks for answers to most general questions. You can also call Seattle Parks Event Scheduling at (206) 684-4080. Many of our centers and special events facilities include stunning views, professional kitchens, and convenient parking. Please visit Special Event Spaces, Community Center, or reserving a Picnic Shelter pages for more information about the locations we offer. We strongly recommend that before you choose a park or facility, you visit the location you have in mind for your event. Invaluable insider tips for working with the city and vendors, planning successful logistics, and managing your event.